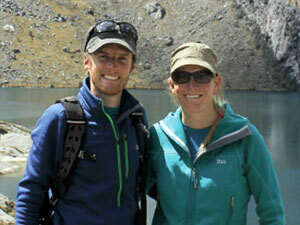 Harriet and Neil Pike met trekking in Chile in 2002 and together began exploring the world's mountains on foot. A chance Caspian Sea ferry encounter with a cyclist in 2007 led to a switch to cycle touring, and a trip across Europe was followed by a few years in the Andes and Himalaya, during which time they fell in love with riding on traffic-free dirt roads. Neil spends hours poring over maps and scouring satellite images for routes; Harriet is the gear geek and team bike mechanic. They blog at pikesonbikes.com and run the website andesbybike.com.